Hand of Fate 2 is ranked in the 86th percentile of games scored on OpenCritic. Hand of Fate 2 wisely switches away from Hand Of Fate's purity, which saves it from repetition but discards its trump card in the process. Hand of Fate 2 improves upon the original in every way. Hand of Fate 2 impresses in many ways and does everything it is trying to do right. If you’re in this target audience, Hand of Fate 2 can offer a fun adventure that will keep you engaged for hours. Hand of Fate 2 is a welcome reminder that RPGs don't have to fall into one of two categories, and its heady mix of deck building and Arkham-esque combat make for a unique experience. Arriving on Switch it's found its perfect home, and its bite-sized story and action that are ideal for gaming on-the-go. This is one of the best games Australia has ever produced. Defiant Development is a Dungeon Master getting better at their craft, taking us through a series of campaign filled with new mysteries, twists, turns, and mechanics. Not content with jut polishing up the formula of the original game, Hand of Fate 2 takes a step forward and defines what a sequel should be. Improvements abound, challenges await, and every single failure begets the promise of a bigger success, if you'd chance your fate in the cards. Honestly, I can't recommend Hand of Fate 2 enough. If you’re a Switch owner and an RPG or tabletop fan, there is absolutely no reason for you to not own Hand of Fate 2. It’s a truly exceptional title that shines even brighter on Nintendo’s console. Hand of Fate 2 will be most rewarding to those who like a lot of risk with their reward. Well, gimmicky? Yeah, a bit. Needless? Oh no. Very needed. We aren’t going into all the details of the new games and challenges as part of the fun of the game is uncovering them. (And of course, in true Game Master fashion, listening to our NPC narrator gloat about his creations.) Everything is introduced gradually and, with the deck building aspects, you do have a hand in determining the types of challenges you will face. Hand of Fate 2 is a really good sequel to an amazing game. They have improved on every aspect and added new mechanics in the process. There is a perfect mix of both strategic planning and 3rd person brawling which will satisfy fans of either genre. The strategic among you will love the card planning, although you don't have to plan the cards perfectly, if you think about it and set them accordingly then you could give yourself a massive advantage. This universe is ripe for additions and if the attention to detail can be maintained as well as refinements to its “less is more” design approach, the fate of this game's universe seems to be in great hands. Hand of Fate 2 is truly a unique take on the role-playing genre, with randomly designed dungeons based on the cards within your deck. Whether you are testing your luck, disarming traps, earning gold, or fighting against the undead, each challenge feels uniquely designed. The dealer still knows how to get under your skin with jeers and taunts, but the cards are the most prominent highlight of the game. The inclusions of companions add an additional layer to combat, even if they don't rewrite the game mechanics. In fact, you may experience a different narrative based on which companion you bring along with you. Hand of Fate 2 manages to take everything praiseworthy about the previous installment and make it even better. The challenges players face never look alike and the improved combat system manages to elevate the weakest parts of the original. Hand of Fate 2 is a defiantly different powerhouse fuelled by pure imagination. Speak to The Dealer, he has a story to tell, and he needs your help writing it. Hand of Fate 2’s seamless blend of card-based adventuring and action RPG battles help craft a truly one of a kind experience that’s managed to surprise me in all the right ways. Exciting, unpredictable, often nail-biting, sometimes frustrating but always absorbing, Defiant Development’s distinct take on an action based RPG is a true standout on Switch and well worth checking out. Almost impossible to categorise yet utterly compelling as a result, Hand of Fate 2 brings a new and unique RPG experience to Nintendo Switch. There's just so much to enjoy here; the rewarding premise of its deck-building, the endless depth of its questing, the simple pleasure of its combat. It's taken a little while to make the transition to Switch, but the wait has been worth it; this is a mobile port that's practically indistinguishable from the version you can play elsewhere. Do yourself a favour and get this fantasy romp in your digital library right now. Hand of Fate 2 is a well done sequel. It adds a lot more to the game while keeping things both familiar and fresh at the same time. Hand of Fate 2 builds on the success of the original release in every way imaginable. 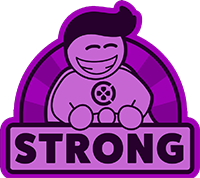 More cards, more encounters, more enemy types, more weapons, more special abilities, more challenge…it's an improvement across the board. All of these improvements are done without sacrificing the core elements or integrity of the series. If this genre-blending beauty has even peaked your interest in the slightest, pick this one up. Hand of Fate 2 is what a sequel should be. It adds so much to the game while fixing many, if not all, of the critiques of the first game. The few frustrations that are created come nowhere near the superb design, and replayability, this game has to offer. I like it that missions are replayable especially if you miss to collect a certain coin, this also helps in your experience with combining different cards to have the most successful outcomes. This game is like a mashup of a card game, board game and an RPG game that blends really well together. A very solid game, it’s that little gem that needs to be known by everyone. Hand of Fate 2 is a fun game with an interesting mix of board game/card game/action game mechanics that perfectly come together to make it all work. There is certainly a luck element thrown into the mix due to the dice and card gameplay mechanics, but in the end it makes for a very fun and dynamic gaming experience. I definitely liked what the team has done with this sequel and I look forward to seeing what they end up doing next! In pretty well every way Hand of Fate 2 has run with everything that made the original work and has made it better. The scenarios all test you in unique ways, the number of unique event cards has greatly expanded which allows for far more versatility as the game progresses, and the trials in both combat and gambling have diversified greatly. The result is a very challenging and thus satisfying package that blends a degree of chance, skill in building and effectively using your deck, and becoming proficient in the game’s combat. It’s a combination that is really without an equal on the console and is highly recommended if you’re looking for a sustained challenge on the Switch. Hand of Fate 2 improves upon nearly every aspect of the original, providing diverse new challenges that help build the world around the Game of Life and Death. The new scenarios, the success checks that come with them, the companions, and new encounters and gear cards all add hundreds of unique touches to the game that make every card flip an experience. With all the new additions I think this is a great sequel to a great game allowing new people and already experienced players to have a wonderful time. I definitely would recommend Hands of Fate II. Hand of Fate 2 is certainly a much more improved product over the original. Upgraded presentation aside, there's more of a story to back up the game, so you're given a purpose instead of playing The Dealer's game just for the sake of it. Combat may not have improved much, but everything else has, making for a deeper journey even if luck spoils things now and again. Even without the upcoming extras, Hand of Fate 2 is worth checking out. 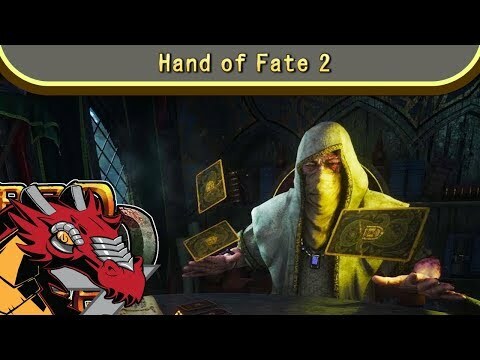 We both had a lot of fun with Hand of Fate 2, and feel that the mix of a card game, a board game, a choose your own adventure game and an action game is a solid one that keeps players engaged. It's a mash-up of several genres, but the way they're brought together just makes everything work. Hand of Fate 2 is a game that rewards skillful selection of cards to be put into a luck-of-the-draw situation. Set up good situations and hope that they play out the way you plan. Hand of Fate 2 greatly outdoes its predecessor with a much better combat system and gameplay that will keep you enthralled for hours upon hours. Hand of Fate 2 is a satisfying sequel and a meatier dungeon crawler, but still somewhat hampered by limited combat. Updated graphics, additional gameplay mechanics, and engaging storytelling make Hand of Fate 2 an enjoyable gaming experience. Hand of Fate 2 is one of the most diverse, unique games I've played in quite some time. It's rare to find a developer doing something new these days, but Defiant Development successfully mixes the 3D action genre with a card and board game. 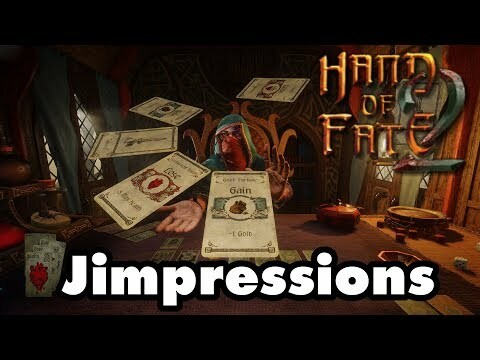 If you're looking for a weird, dark fantasy card game with intense action in between, don't sleep on Hand of Fate 2! Hand of Fate 2 doesn't change much of the concept that made the first game so appealing, but everything here – whether it's challenges, smarter deck building, companion characters, and better combat – marks a major improvement over what we saw in 2015. Repetitiveness can still be a problem, but it takes much longer for it to show up. This time around, this is definitely a hand worth playing. Clever developments to gameplay and visuals make this sequel an exciting progression that can become an act of patience when the numbers stop going your way. Hand of Fate 2 merges tried and true conventions and creates a unique experience. While the individual components lean on the simpler side of things, as a whole the game is greater than the sum of its parts. It's a game that's best played in small chunks, making it a very good entry to the Switch library! The original Hand of Fate had a Vita port planned, which sadly never came to fruition. Hand of Fate 2 on Nintendo Switch shows just how good that port could have been. It's so absurdly addictive and utterly unique. It improves on the original in every way and is a truly unique experience. It takes elements of so many different types of games and mashes them together; a process that usually results in a metaphorical goopy mess, but here it's somehow turned into gold. If the combat were just a touch more dynamic, Hand of Fate 2 would be essential. As it stands, it's still a great sequel and perfect for anyone wanting the thrills of an RPG without feeling loss. Defiant constantly prod players into the unknown and the results are always fun and rewarding. So overall, the surprise success has spawned a fitting sequel in Hand of Fate 2, with deeper RPG elements, interesting lore and some really great challenges which all feel different. The tabletop side and the new action elements blend together well to keep the excitement levels high, as do the new mini-games to test your nerve, skill and luck. As a sequel, there are some solid improvements made that result in an overall better game. The deck building is better now and there is more variety of cards added. Writing feels more concise but the combat is still rather shallow and the load times for each battle don't really help the flow of the game. The effort to port it to the Nintendo Switch is a success without any major flaws or drawbacks holding the game behind compared to the other console versions. A great way to spend your evening while listening to fascinating stories, participating in their creation and trying to finish all levels with best results. Offering more of the same, but for the better, Hand of Fate 2 is more of what you liked, none of what you didn't over the original. Defiant Development have done exactly what you need to do for a sequel, improve and cut out the fat. The improved missions and importance of character creation and development make it feel more personal and like your story, rather than playing someone else's. Hand of Fate 2 offers a lot of variety you would have to play several other games to get in the quality that's available here. Hand of Fate 2 is an interesting fusion between deck building games mechanics and the worl of Interactive Fiction. Defiant Development has created a nice fusion between narrative driven game with a high number of player choices. The original Hand of Fate was a game I had heard a lot about, but never got around to. The Switch is encouraging me to go back and pick up a lot of these titles, and this is one worth grabbing a hold of. Just be sure to watch the cards and choose your battles wisely, and you'll have a tale that will live on through the ages. It's amazing to see a game like Hand of Fate 2 on the Switch, as it makes perfect sense for portability and presentation. While the sequel is everything from the original Hand of Fate and more, I'd still like the original end up on here for completeness. Defiant Development have done a great job at making the game work well on the Switch to be comparable to the other systems the game appears on. You'll likely not play anything like Hand of Fate 2, and is absolutely worth the purchase no matter where you can get it. Hand of Fate 2 has stellar writing, fun deck building, and interesting stories. What it doesn't have, however, is good combat. While I have grown to find the combat manageable, it should be fun and exciting. It stands as an odd blemish that has been carried over from the original while everything else as been prettied up. Still, I recommend giving Hand of Fate 2 a chance, especially if you never played the original. Even with the lackluster combat there is plenty to enjoy here. The quality of the overall experience is held back by the repetitive combat. It's a shame, too, as if this area of the game was improved, Hand of Fate 2 could have been something truly special. Hand of Fate 2 improves on its solid predecessor, but it's a couple of cards from a royal flush. The Dealer is back from the netherworld, ready to challenge anyone brave (or foolish) enough to sit down and play his game. Hand of Fate 2 brings many beloved elements from the first game, like The Dealer’s signature insults, with a few tweaks here and there to create a smoother, more intricate sequel. Half rougelike, half deck-building card game, Hand of Fate 2 keeps the same mechanics in place that make it so unique, but it’s not a game for everyone. A nice mixture of card RPG and real-time combat, Hand of Fate 2 offers near endless gameplay that's genuinely fun and atmospheric. Hand of Fate was quite good and I was waiting for sequel. I had hopes for much more adventure cards, but I've got game with many small broken things. It's not what I hoped for. Probably best reserved for the most diehard fans, but even they should enter with caution. Hand of Fate 2 captures some old-school RPG charm, but deals a few too many bad cards in the process. The game's appealing premise is marred by unsatisfying progression, punishing randomness, and clunky combat. Nostalgic RPG fans will find things to appreciate here, but given the popularity and diversity of actual tabletop gaming these days, it's hard to fully recommend the half-stacked Hand of Fate 2. Defiant's hybrid action-RPG Hand of Fate 2 arrives to the Nintendo Switch. It should be more of what made the first installment so interesting, but in the end, Hand of Fate 2 makes additions that turn the dungeon crawler into a story-driven adventure. It also has a major focus on luck-based challenges and fights, being more predictable and frustrating than its predecessor. Hand of Fate 2 attempts to combine the fun of tabletop games with video games, but its commitment to that pitch is its downfall. The portals to combat filled me with nothing but grunts of exhaustion everytime as I drew my weapon. If you are able to look past the dreaded combat, there is a fun tabletop RPG here with interesting stories to tell, but I personally can't stand to do another one of those combat scenarios. Sorry, The Dealer wins.